If one were to go back in time and were to pay attention to the 18th-century barns in the UK, they would be most impressed. These barns still exist and give us some insight into what life was like and what architecture was like during this time period. 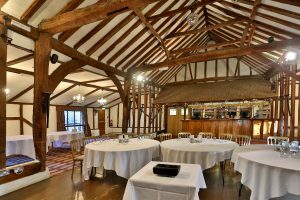 Although they may no longer be used to provide accommodation for the landowners’ horses and other livestock, there is at least one that has undergone a barn restoration that has allowed it to be turned into a restaurant and hotel. One very smart business owner recognized the value of the structure of the buildings on some farm acreage that dates to the 18th century. With a clear vision in mind, these old buildings including the barn were restored to modern-day facilities. All of this was done while keeping the ambience of the barn and its additional buildings. This has created an old-time atmosphere that guests who stay at this establishment get to enjoy. This particular barn and buildings are located in Cannock Chase. This is a region located in Staffordshire England. Thanks to its beauty and history it has been titled as being an area of outstanding beauty. It has never lost the charm of its natural aura. One can step out of the doors of the Hotel/Restaurant and envision a pasture full of beautiful horses grazing along with the cattle and other livestock that was so important to the sustaining of the people who lived in the 18th Century. Barn restoration has become an increasingly popular trend throughout the UK and it is a wonderful way to preserve history yet deter the deterioration of age-old barns that make up the history of this country. Those that still house and breed horses have turned to more modern facilities that allow them to be more manageable and cost-effective.